When it comes to the centre of prestige property in Australia, no one does the upper end like Sydney. There’s been plenty of column inches in the past few months devoted to the softening of Sydney’s booming real estate prices, but as smart property pundits know, you cannot blanket and entire market with a single, simple summary. Let’s step back a moment and consider the sector that’s come to define the upper echelon of luxury real estate and ask, ‘Is the prestige market still a hot prospect in the Harbour City?’. The clue is our nickname, because if you live in the aptly monikered ‘Harbour City’, you want to take full advantage not just of the stunning vistas but also the stylish culture that's part our waterfront lifestyle. While it takes serious dollars to own a prestige piece of our town, there are always cashed up buyers with an eye for quality who are ready to enjoy home in one of the world’s best capitals. Mark Twain's once astutely observed we should try to buy land because, “they're not making it any more" and this applies tenfold to Sydney. There's only so much harbour, coastline and natural splendour to acquire and only so many city views. Buyers who have the wherewithal to enjoy them are prepared to pay handsomely. As a central hub for the nations professional services, Sydney attracts its fair share of international standard executives and business owners keen to make their mark. When one of these high flyers comes to town, they’re generally not living 30 kilometres from the CBD. It's too far, it’s impractical and it doesn't have the prestige or opulence that comes with Sydney's inner suburbs. In addition, many major companies will help cover the cost of lodgings for top level employees they've gone headhunted and they're prepared to pay for it! Expats are starting to re-examine the Sydney market and think about their re-entry as the Aussie dollar is sitting around 75cents compared to almost parity with US dollar 5 years ago thereby making our prices more attractive. Sydney's prestige market defied the overall trend in 2017, with multi-million dollar properties - some in the tens of millions - selling at Point Piper, Dover Heights, Tamarama and even around Bondi. As you now know, most of Sydney's prestige market is located on the water - either overlooking the main harbour, its estuaries or the ocean. Double Bay is well named. The median house price, which was just over $2 million in 2013, has almost doubled in the five years since to be nudging $4 million. Unit sales have gone the same way, crashing through the million-dollar barrier in 2014 to steadily climb to around $1.5 million. 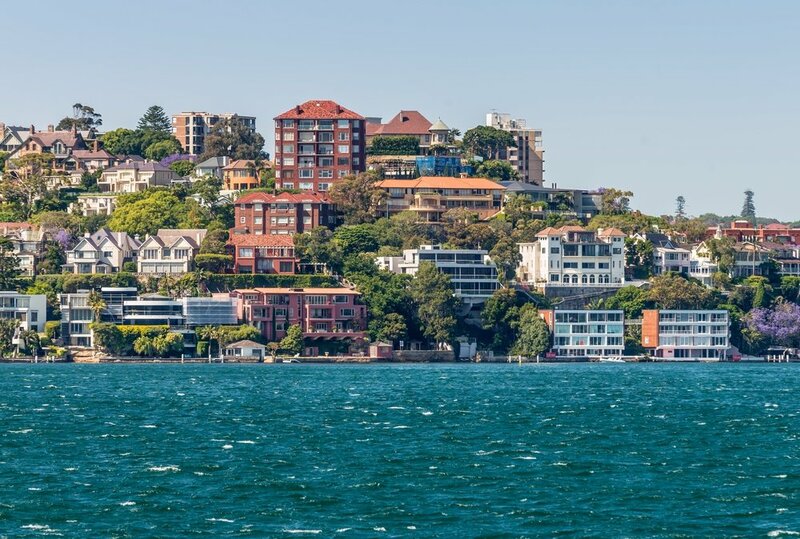 Double Bay is only a small sample, of course, but it's indicative of the prestige market. The trend is real and so is the ongoing demand. Want further evidence? Nearby Vaucluse went from just over $3 million to in excess of $4.5 million in the same period. Bellevue Hill went from $3.5 million to $5.5 million… give or take a few dollars. The reason for the latter is a classic case of supply and demand - not many houses come on the market at Bellevue Hill and when they do, there are always buyers. These prestige addresses – and many others – are growing ahead of the national trend. They're making light work of the property target of doubling in value every 10 years. As recently as the 1990s, very few people wanted to move into Balmain. The working-class hub was gentrified in some parts but run down in others, and only those who grew up there tended to live on the peninsula. For many, success meant moving away. In 1990, you could buy a house in Balmain for under $200,000. How times have changed! Imagine how short-sighted some buyers must feel not to have realised just one generation ago that a suburb which wrapped around part of Sydney Harbour would increase in value? Balmain was already on the move in 2008, but both the house and unit market has doubled in the 10 years since. It's not just a case of asking where the next Balmain is, when it comes to the prestige market. People in this sector demand luxury, so if you identify pockets of Birchgrove, Roselle or Drummoyne that have prestige potential, that potential has to be cultivated before the buyers arrive. Prestige buyers won't be bringing their hammer, spirit level and tape measure with them. They're not after a reno opportunity, they're after comfort, views of the harbour and everything that opens and shuts. You only need to look at the continued trend of new upmarket developments in Sydney city and its inner suburbs to realise there's ongoing demand for prestige property. A recent penthouse listing at the top of the ANZ tower is set to re-benchmark ultra-prestige unit prices for our CBD. Every week, plush apartments sell at Rose Bay, Neutral Bay, Mosman etc. for more than $2 million as well. Make no mistake, there may be plenty of apartments on the Sydney market but there's an undersupply of those that fit into the prestige category. Major developers have been a bit slow in catering to the high end, but that means astute small developers have a window of opportunity - and if they build prestige three bedroom apartments with plenty of windows to take in the views, they're likely to be knocked over in the rush. Perhaps more than any other market, Sydney’s prestige sector relies on having the right network of agents and sellers in your address book. We have buyers’ agents who specialise in finding the perfect property for high-end buyers. Most times, they’re the first to hear about off-market deals and can land the perfect abode before it has a chance to hit the open market. Very discreet, very professional. If you’re looking to acquire your own piece of exceptional Sydney real estate, call us and we’ll show you exactly what can be achieved by our extraordinarily well-connected professionals.